Two University of Virginia police officers were honored Wednesday with meritorious awards for heroic service to the community. At a ceremony at Alumni Hall, UVA Police Chief Tommye Sutton presented Officer Nicholas Champigny with the Medal of Valor, a Purple Heart and a Life Saving Award. Sutton gave Officer Brandon Smoot a Life Saving Award as well. Champigny’s heroism was on full display when, in April, he arrived at UVA’s Health System to serve several felony warrants on a patient who was scheduled to be discharged. The patient took a pair of medical scissors and tried to hurt himself. When Champigny entered the room, the patient began threatening him with the scissors. Champigny first drew his service revolver, but saw the scissors appeared to be rounded on the ends. He re-holstered his weapon, stopped the attack and put the individual in custody – though he still sustained a puncture wound to his abdomen from the scissors. “Officer Champigny showed bravery, concern for the safety of others, and control, in this high stress and potentially deadly encounter,” reads the letter nominating him for the Medal of Valor and the Purple Heart. In a separate incident two months earlier, Champigny and Smoot were called to the scene of another emergency on Millmont Street, where a man was suffering an apparent heart attack. The man’s co-workers had hooked him up to an automated external defibrillator, or AED, and begun chest compressions when the officers took over the scene and continued with CPR. The patient was eventually taken to the UVA Medical Center. The next day Dr. William Brady, an emergency physician, reviewed the data on the AED and discovered Champigny and Smoot’s skilled chest compressions saved the man’s life. 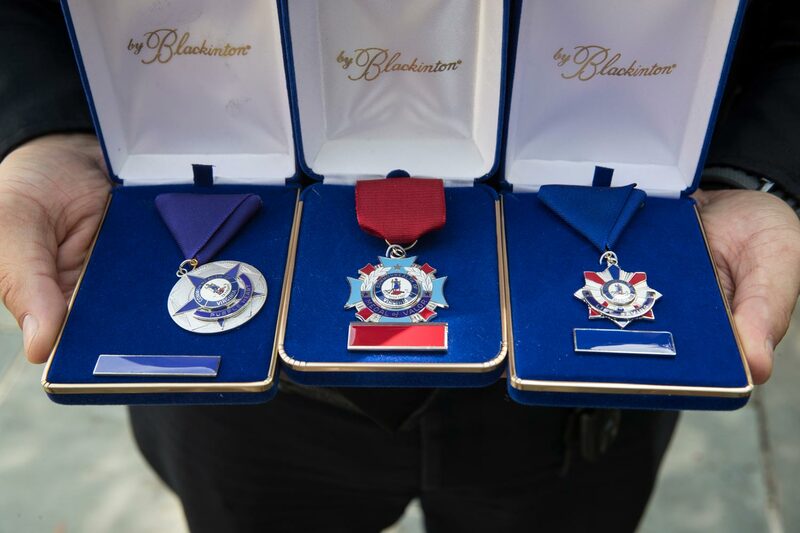 “I want to recognize Officer Champigny and Officer Smoot for their quick response to this situation as well as their ability to manage the scene and event effectively until the arrival of the rescue squad,” read the Life Saving Award nomination letter. The audience was filled with members of UVA’s police force, and Ryan took the opportunity to thank the entire force for its service to UVA and the greater community. “Every action that you take is heavily scrutinized,” he said. “Every action that you take is going to be subject to criticism, and yet day-in and day-out you do the right thing.